10News' Beau Zimmer, right, speaks with a Hillsborough County Fire Rescue member in North Carolina. A 12-member strike team of firefighter paramedics representing the Hillsborough, Pasco and Temple Terrace fire departments left from Tampa on Tuesday. 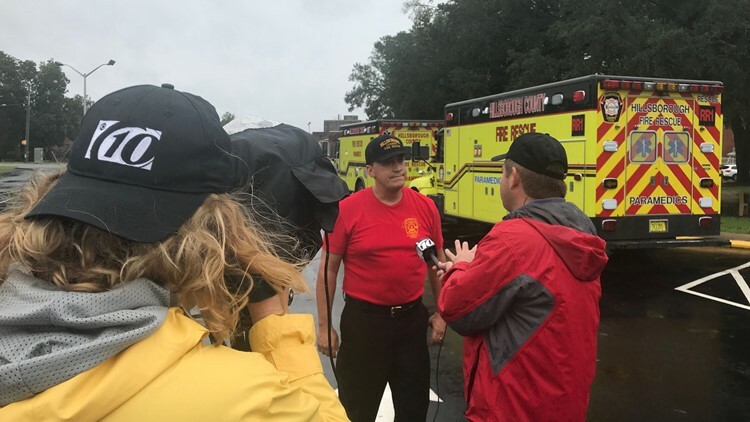 GOLDSBORO, North Carolina— Crews from four different agencies are assisting North Carolina first responders in the aftermath of Hurricane Florence. The team originally staged in Raleigh, North Carolina, and helped transport nursing home patients out of harm’s way ahead of the storm. They’re now assigned to a special needs medical shelter in Goldsboro for patients on ventilators and oxygen masks. Team members say they’re able help on everything from advanced life support, to more basic medical needs or even serving meals for the overworked staff. 10News has been traveling along with the team all week documenting their work before, during and now after the storm. We’ll have more on the team’s experience coming up tonight at 11pm on 10News This Weekend.